It's not often I rant, but I have studied the Ecclesiastical Calendar of the Orthodox Church for a number of years, and every now and then I come across something perplexing, but it is rare that I come across something so perplexing and wrong that I must outright disagree with the calendar and call for reform. One such time is on April 1st, and every year when I see this particular feast in the Church calendar, I feel like it is an April Fool's joke. But it is no joke, and I think it is something our Church leaders should look at very seriously, even though for some reason it seems like no one has ever objected to it, except me right now. Instead, you may only get some note that says: "The identity of this Saint is not known." But I know exactly who he is, and anyone familiar with the Old Testament knows exactly who it is. We read in the Synaxarion of Constantinople under April 1st the following: "Righteous Ahaz died in peace." And when you look at a detailed calendar of the Church feasts under April 1st, you will see "Righteous Ahaz" mentioned (Old Testament saints most often bear the title of "Righteous"). The immediate reaction for those familiar with the only Ahaz in the Bible and Church history is: "Wait a minute, it can't be that Ahaz! You mean the Ahaz who swore an allegiance to the Assyrian gods and erected an altar in their honor in Jerusalem? You mean the Ahaz who offered up his son as a burnt offering to the god Moloch? You mean the Ahaz who when he died at the age of 36 was not brought into the sepulchre of kings because he died in wickedness and refused to worship the God of Israel? That Ahaz?" Yes, it is that Ahaz. But then you may ask me: "Are you sure it's that Ahaz?" Yes, I'm sure. "How are you sure?" Good question. This is how. Ahaz who said, "I will not tempt my God." But Ahaz said, "I will not ask, nor will I tempt the Lord!" In the Greek Septuagint, the quote says, "οὐδ οὐ μὴ πειράσω κύριον" (nor will I tempt the Lord), while in the Synaxarion of Constantinople the iambic verses say the quote says, "ου Θεόν μου πειράσω" (I will not tempt my God). This indicates a big difference of understanding this verse. When you read Isaiah 7 in context, Biblical commentators pretty much unanimously agree that when King Ahaz speaks in Isaiah 7:12, he is doing so as one showing a piety and faith he did not truly have. He is saying he will not put Yahweh to any such test as mentioned previously in the chapter by the Prophet Isaiah. Not, perhaps, without a sneer, he quotes almost the very formula of the Law of Moses: "Thou shalt not tempt the Lord thy God" (Exodus 17:2; Deuteronomy 6:16). He never calls Yahweh "my God", but he calls Him "the Lord". Perhaps he acknowledged Yahweh as a god among other gods, though weaker than his gods, but certainly not as his own god, as Scripture makes clear. So why didn't the compilers of the Synaxarion of Constantinople understand this? Saint John Chrysostom knew, and wrote about it in his Homilies on Isaiah. My way of justifying the error is simple - whoever included the name of Ahaz, took the show of piety displayed in Isaiah 7:12 as if it were real piety, perhaps due to his own simplicity and lack of guile, and thus Ahaz earned his sainthood and title of "Righteous". But we know better now, so Ahaz should be removed from the calendar of feasts of the Church. However, there is another problem. 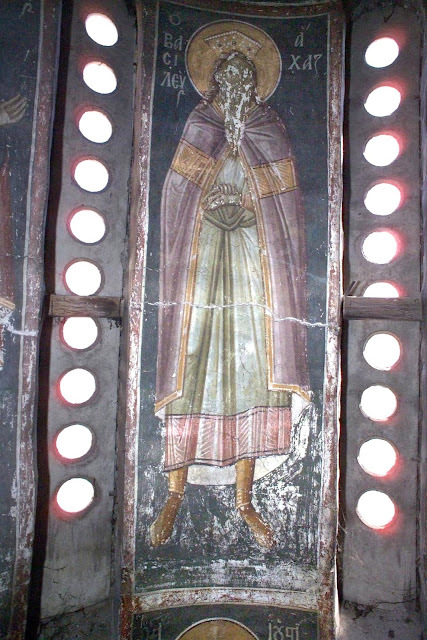 At the Gračanica Monastery in Kosovo, Serbia there is even a fresco of King Ahaz depicted among the righteous Kings of Israel and Judah, with a halo over his head (depicted at the top of this article). Clearly the iconographer was familiar with his inclusion in the Church calendar, but not with his story in the Old Testament (perhaps this may be why his face is scratched off?). In all humility, I have no authority to change the calendar of the Church. So for now, at least on April 1st, I will refer to him as "Righteous Ahaz", until the day those in authority in the Church do what is right and remove him from the calendar. But I will do so merely commemorating the simplicity and lack of guile of the one who included him.